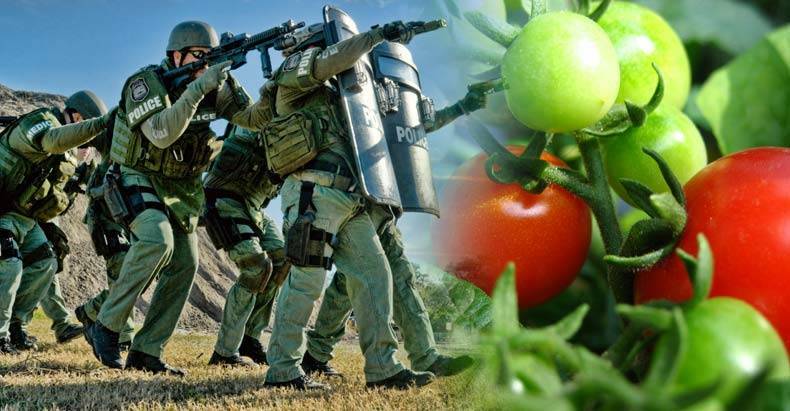 Arlington, TX — In an effort to protect the citizens of Texas, a massive military-style raid was conducted on the Garden of Eden organic farm and commune. On August 2, 2013, nearly two dozen heavily armed SWAT officers stormed this peaceful farm in search of a plant. They found lots of plants, but much to their dismay, they did not find the plant they were looking for. Countless tax dollars and months of half-cocked planning went down the drain that day after it was discovered that police incompetence had led these troops into a battle to which there can be no victor. In the days leading up to this asinine military assault on a peaceful commune, the ineptitude of the Arlington police department was oozing from the seams. Arlington Detective Magdalena Perez, through a series of poor decisions, frivolously came to the conclusion that the peaceful hippies at the Garden of Eden were up to no good and were cultivating marijuana. The horror! However, Perez was terribly wrong. Prior to the raid, these heroes even conducted a flyover of the farm and wrongly determined that the Garden of Eden was an evil pot farm. But they were mistaken. After their 20 soldiers had stormed the garden, the Arlington police found not one single gram of marijuana. Since they couldn’t arrest anyone for growing pot, these public servants decided that they didn’t want to go home empty-handed, so they began writing citations for code violations, like untrimmed bushes and tires laying around. Then they arrested a member of the commune, Quinn Eaker, for an outstanding traffic ticket. Now, just over two years later, the Garden of Eden farm is seeking damages, and rightfully so. This peaceful group was held at gunpoint and terrorized for hours because of the incompetence of the Arlington PD and the immoral nature of the war on drugs. The lawsuit, filed by Garden of Eden residents last month, claims police violated their rights to be free from unreasonable search and seizure. They are seeking compensation for the property and emotional damage caused by the raid, along with the legal expenses they have incurred. They are also asking for punitive damages, “because the City of Arlington and Detective Perez showed a reckless and callous indifference” to their constitutional rights, according to Reason Magazine. The residents of the farm will undoubtedly win this lawsuit, and the monetary settlement will come from the taxpayers. The 20 armed men who raided the farm along with the inept detective and the rest of the department who initiated the raid will remain on the job. They will receive their regularly scheduled promotions, and nothing will change. Until officers are held individually liable for their irresponsible actions, this blank check of negligence will continue to grow, and continue to be passed on to the backs of those who do not deserve to carry its weight, the US taxpayer. For information on how you can take part and force individual police accountability in your town visit this link.